What a fun way to kick off Kansas City Fashion Week! 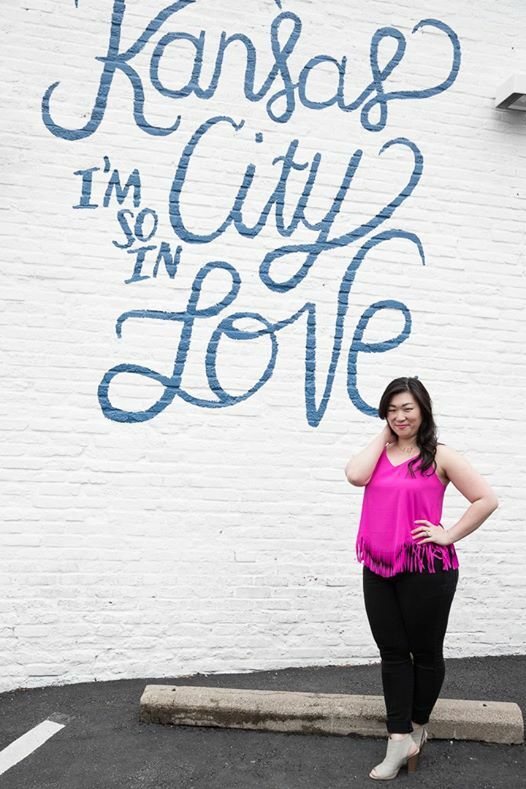 KCFW hosted their media event at Fortuity, a Baltimore Ave boutique known for it's iconic 'Kansas City I'm So In Love' wall. There were delicious sweet treats from Dolce Bakery (if you're ever there try the key lime tarts and flourless chocolate espresso tortes, YUM) and cocktails from KC Wine Works. I loved that we were supporting great local businesses. So there I was pretending I didn't just eat two desserts, sipping my drink, not wearing yoga pants, feeling very sophisticated and cosmopolitan. My nights are usually spent at home uniformed in stretchy athleisure wear hanging out with my fam. So I took this rare night out to wear my fringed fuchsia top. I love the combo of the bold brightness with the neutral skinnies and grey booties.